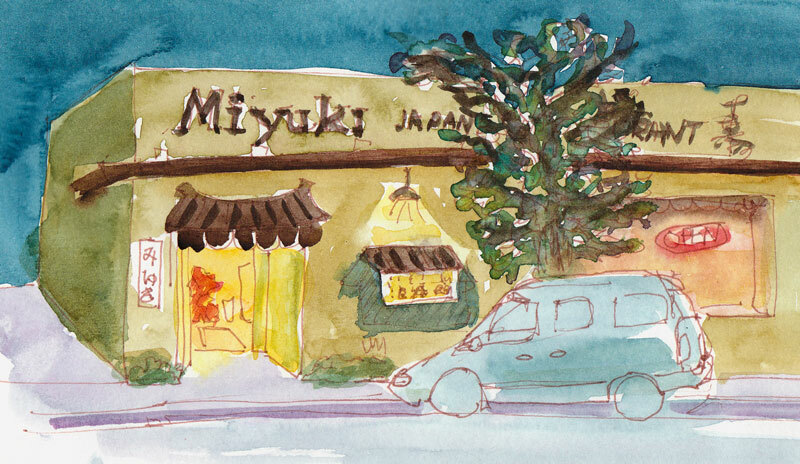 Tuesday night sketchcrawl met at Miyuki Japanese Restaurant on Solano and it was a feast for the eyes and the stomach. 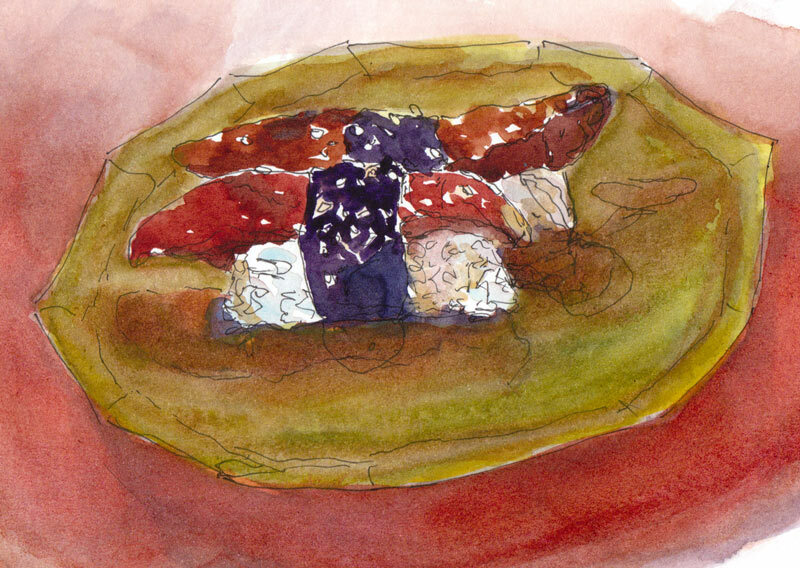 It took tremendous willpower to sketch and paint each morsel before eating them. 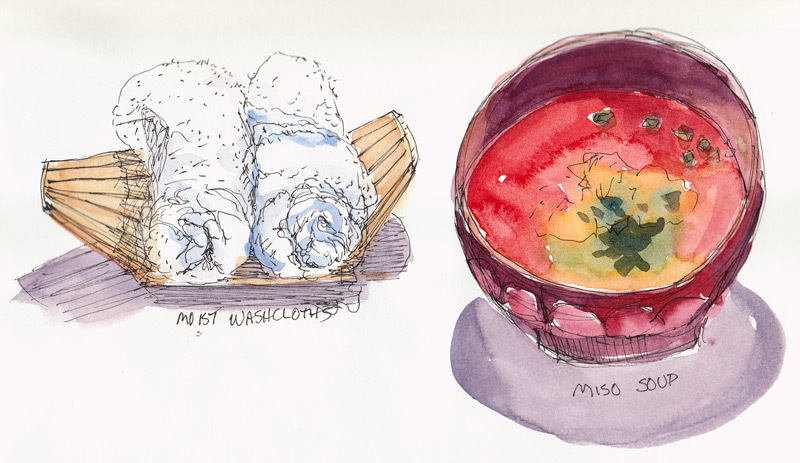 I started with the miso soup, delivered with steamy wash cloths to clean our hands before dining. They brought edamame to our table while we looked at the menu. 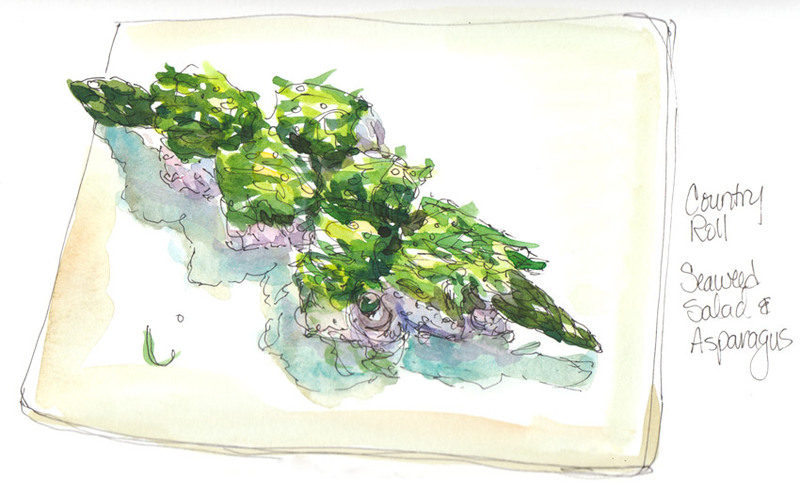 I sketched and ate them after the delicious miso soup. We sat at the sushi bar and had fun watching the sushi chef. He seemed to enjoyed watching us sketch,e specially Cathy’s sketch of him. Next was the maguro sushi on a wooden plank. Spectacularly fresh and delicious. Then it was time for the star of the show, the Country Roll, stuffed with perfectly crisp asparagus and covered in spicy and slightly sweet seaweed salad. For “dessert” I ordered Unagi (grilled eel with a teriyaki-like sauce. The waitress couldn’t quite make sense of us but since the restaurant wasn’t too crowded they didn’t mind us sitting there for two hours sketching and eating. And we left a big tip. All of these were sketched and painted on site except for this last one, which was sketched in the dark from across the street when I first arrived. I took notes about the colors and added color when I got home. I highly recommend Miyaki. The food is always fresh and beautifully prepared, the staff friendly, efficient and helpful and the prices very reasonable. It’s spacious so there’s never a wait and it’s not too noisy. And it’s a great place to sketch on a Tuesday night! Next Post: What is This Bug I’m Fighting? These sketches are delightful! You did all this in 3 hours AND ate the food? WOW! 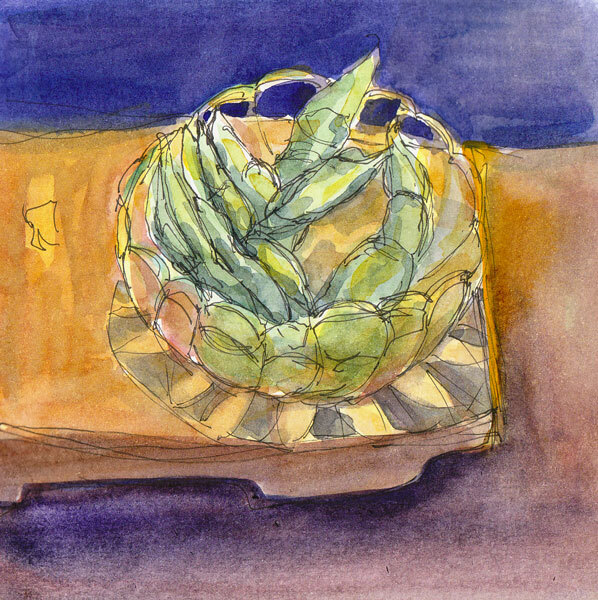 Wow – didn’t you get hungry while you were sketching? Beautiful job, Jana – the colors are gorgeous! Sushi is one of the things I miss the most eating low-carb. The way you’ve painted the pickled ginger is masterful. But what I’m really wondering, is what did you do with your “hour”? You’ll have to fill us in. I was wondering what I would say if someone asked me that, because I did it differently this year. Sunday afternoon I decided I would take a walk and if I timed it right, I could be home before I left. But I;d been having so much fun playing with taking that hour again and again that I didn’t change it on Sunday. I didn’t change it on Monday either, just hung out in the studio still relishing the possibilities. But Tuesday I had to work (from home) and realized I didn’t want another hour of WORK and since I needed to be at the restaurant to sketch at 6:30 I finally changed my clocks. Instead of one free hour I probably experienced at least a couple dozen over those three days. Goofy but fun! Sure! fine! now I am hungry. Beautiful paintings. l loved the food posts. The Hydrangea is wonderful also. You really caught the “flavor” of the food. As in, it looks good enough to eat. I recognize that Country Roll! Did you order by visual appeal? 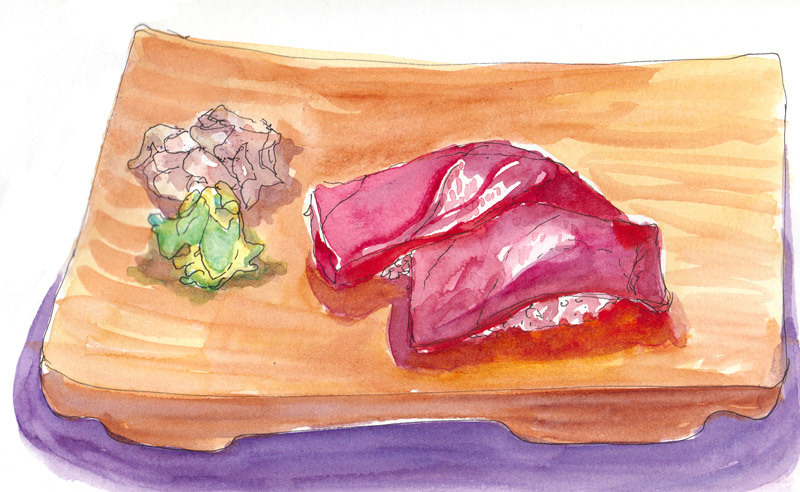 The colors of the Maguro are most appealing.